Shown here are two 18k white gold wedding bands made from the clients original 22k gold wedding bands. 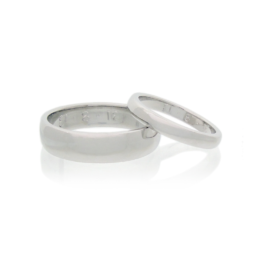 The rings have been finished with a hard wearing, white rhodium plated finish. The gold was alloyed down from 22k yellow gold to 18k white by Amanda in her studio. If you have some existing gold or heirloom jewellery you would like to remodel, please get in touch with Amanda to discuss the possibilities.